With beautiful captures by M. Felt Photography and fabulous floral design by Bloomers Flowers and Gifts, today's bridal shoot is filled to the brim with romantic touches, a gorgeous gown by Truvelle Bridal — oh, and did I mention the amazing colors? From the photographer, "For this styled shoot, I was inspired by Tinge Floral's #theantiflowercrown concept." The idea behind this concept is to incorporate sweet florals into the hair in ways that aren’t necessarily the traditional flower crown. Go ahead and check out the hashtag! I'll be right here when you get back! So many gorgeous hairstyles with florals. Am I right? From the team, "We wanted to highlight the bride's lovely chiffon dress from Truvelle Bridal and her classic hairstyle with lovely flowers pinned loosely throughout." The garden of an old 1800's home made the perfect place to bring this shoot to life! Bloomers Flowers and Gifts did an amazing job with the florals! And what's not to love about the idea of bringing the inside out with these beautiful, vintage style pieces? I just love this hairstyle with the curls and the little blooms sprinkled throughout! 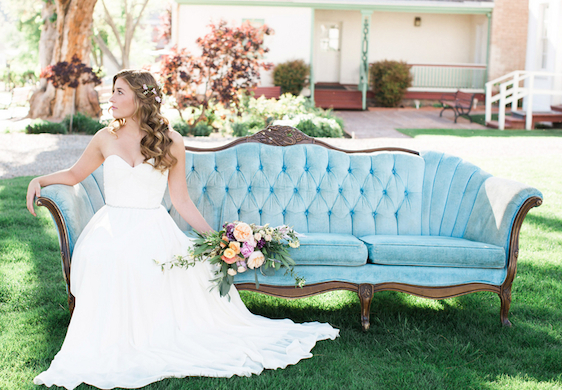 And what's not to love about this beautiful, blue vintage sofa provided by Swoon Vintage Rental Co.? A sweetheart neckline creates a lovely effect and a thin crystal belt adds a bit of glam! Speaking of glam, can we just talk about how gorgeous this makeup look is? This is what you call garden glam done right! And ahhh, I'm just in love with this array of colors! Such a sweet hairstyle with some up and some down! And how romantic is this canopy of trees? A garden is such a sweet place to say, "I do," if you ask me! And what's not to love about these simple centerpieces? A criss cross back adds romance to this gorgeous gown... It almost mimics the braiding in her hair! And just look at how twirl-worthy this gown is! Swoon, swoon, swoon, m'dears! So elegant, so sweet, so absolutely romantic! And a garden wedding is not complete without a gorgeous arbor! Lots of love to this talented team of wedding pros from Utah! Such an inspiration! Photography: M. Felt Photography // Floral Design: Bloomers Flowers and Gifts // Gown: Truvelle // Rentals: Swoon Vintage Rental Co.
No Comment to " Garden Glam Bridal Inspiration "